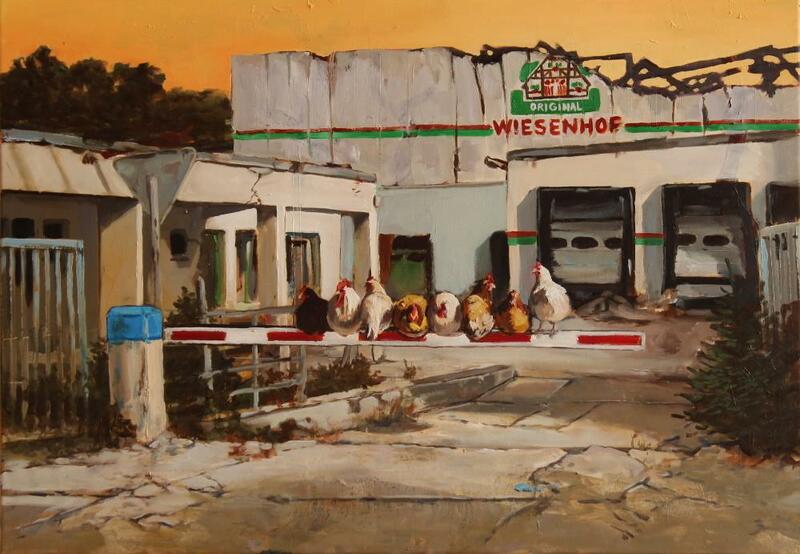 Paintings by artist Hartmut Kiewert speak volumes. One can see the remaining ruins of an old factory farm in the distance, with chickens, pigs and cows roaming freely on the streets. 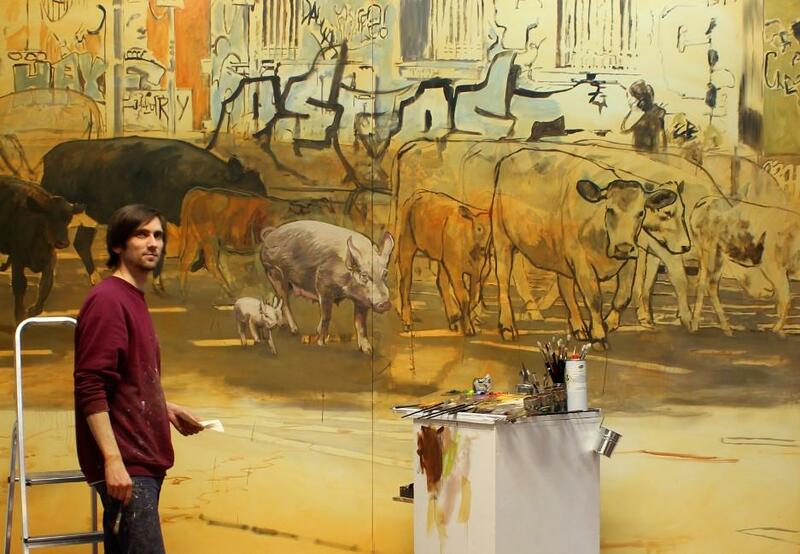 In his paintings, intensive farming is history and so are animal-based products. Can this be a reality of the future or just a utopian dream? We talked to Hartmut Kiewert, who explained why he is committed to the relationship between humans and animals and what he hopes to achieve. 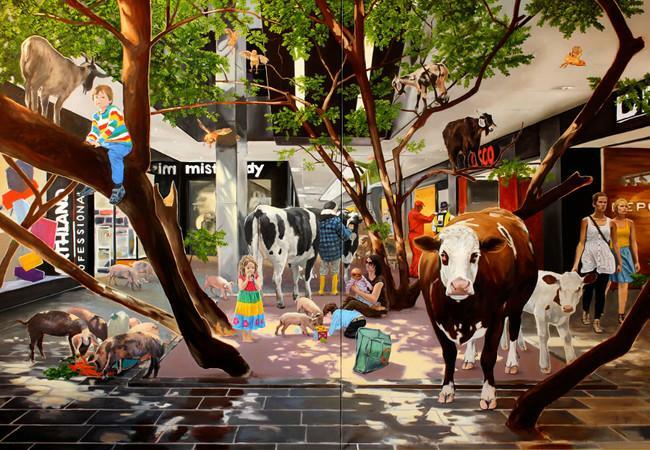 When did you discover your passion for art and why is your focus on the human-animal relationship? Since I was a child, I enjoyed drawing, and had the desire to become a painter. I started drawing in 2001 while studying architecture. In 2003 I wanted to change my major and switched to pursuing painting and graphic design at an Art Academy in Germany. During that time, I had to deal with frequent social and political criticism. I wanted to incorporate these insights into my paintings and searched for a suitable topic. The ambivalent relationship between humans and animals has always been in my interest since childhood, and I am not alone in this as the depiction of the human and animals are also found in cave paintings. That's why I see my work as an ideal way to illustrate this topic. Very different things inspire me. The pure observation of inspiring paintings can create certain impulses as well as random things I see during the day, the debates on sociopolitical contexts or conversations about pictorial worlds. All these things work constantly in the back of my mind and at some point, new ideas for pictures will emerge. Even whilst I am painting, I can get ideas and inspirations for new paintings. 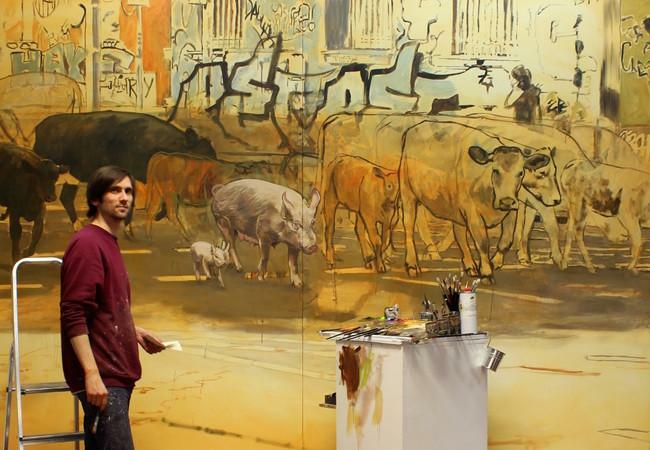 To what extent does the consumption of animal products play a role in your art? When I began dedicating my artistic work to the critical reflection of the human-animal relationship more than 10 years ago, the consumption of animal products was an immediate topic. People, so to speak, encounter parts of animals in the form of products in the supermarket or on their plates on a daily basis. That's exactly what I wanted to discuss. The repressed violence against the individual animals which entails the consumption of such products, should be sensed in the picture. Even in the utopian scenarios, this is still the topic. Pigs and goats appear in a shopping mall for example, the pictures point out that in today's everyday world, these animals sadly only appear at these locations as body parts and ingredients that are merely seen as food items. In your series of pictures "ANIMAL Utopia" you give animals a new and different habitat, far away from intensive livestock farming. They live free on the streets, within houses, forests or parks - among us. Is this how the future will look like? My painted scenarios are initially an attempt to irritate the observer. The fact that so-called "livestock" does not otherwise appear in our everyday world but are locked behinds the doors of factory farms and slaughterhouses raises the question of why they are kept like that and killed for human consumption. Why don’t they walk among us on the streets instead? I am happy when I use these scenarios to stimulate utopian thoughts: Thinking about how our transport infrastructure would have to change so that animals, as well as humans could move around safely. I hope that my pictures will give a certain forecast into future scenarios without exactly defining them. Farm animals are fascinating animals. Could you share a special experience you’ve had during your work, which was quite memorable? The first time I ever visited a farm sanctuary was to do some live animal portraits, and I got to know two cows; Anna and Emma. While I was setting up my equipment, they came up to me and curiously examined all of my painting utensils. I was not able to start painting because they were licking and sniffing on all my tools. I had to build myself a small "painting enclosure" in order to create their portraits! Another experience was in May 2018. It was a very hot day and I was painting turkeys sitting in the shade. For the first time, I consciously perceived how a bird breathes. Sanctuaries are practically a kind of concrete utopia of a new human-animal relationship. It is always a wonderful experience to meet and get to know animals there. Do you think that the entire earth’s population will eventually get by without animal products? Of course, I hope that any kind of animal husbandry will one day be abolished and the relationship between humans and other animals will be mutually respectful. The way to get there is likely to be a slow process, with fewer and fewer animals being kept in succession. We would then have to consider, as we have already mentioned, how to design the villages, towns, infrastructure and mobility in such a way that they offer the opportunity for "companion and farm animals" to co-exist, and if they’d like to detach from humans, so that they can also be amongst their own kind. I could imagine that pigs, chickens and cows will walk freely in their appropriate urban and rural areas as they please. Please complete this sentence: "If I'm not painting, then ...."
... I am involved in a local animal activist group, in the Rhythms of Resistance Action Samba Band, do office and organizational work such as exhibition planning, updating my website, sending orders, helping my girlfriend in her organic garden and I´m also interested in different kinds of social criticism. Where can interested people see your work? Currently, and until the end of October 2019, some of my paintings can be seen at "The space between us / about nature" group exhibition in the Nietzsche Documentation Center in Nürnberg (Germany). Galerie KK in Essen showcased my paintings at the "At the Beginning of the Drawing” exhibition back in December 2018 and will be running until the end of February 2019. 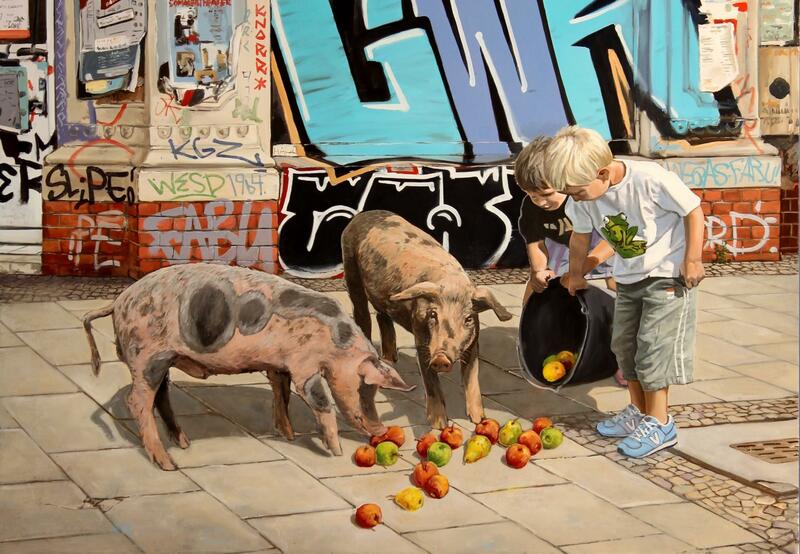 Alternatively, my paintings can be found at my gallery in Leipzig.